It is known that people migrated from the islands of Southeast Asia to Madagascar in the 7th to 14th centuries, but nothing is known of what kinds of boats there people used to cross the Indian Ocean. However, a close examination of laka, the canoes used today along the west coast of Madagascar, reveals the existence of structural traits found in Austronesian canoes. 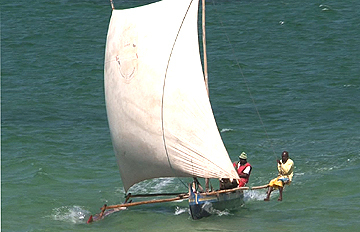 The aim of this film is to identify the Austronesian traits in Madagascan canoes, by reference to the types of East African coast. Canoes are complex tree-dimensional moving structures, making them ideally suited to exposition in a visual medium. Computer graphics and 3D computer graphics elements are added to conventional footage to help describe the form and function of the canoes. This is a fresh application of the film medium. Taking advantage of the possibilities of visual representations, computer graphics and 3D imagery are superimposed onto normal film footage to effectively and clearly convey the forms and functions of the various types of canoes. A good example of a media-mix ethnographic film, also featuring a clear, easy to comprehend structure aimed at inspective comparisons. Production / Copyright Studio UMI Inc.